I dressed up like a pirate recently, as part of the costume I wore my grandads old binos. A guy told me they were opera glasses. I laughed at him because there’s no way my grandad was into opera. So I googled them, and he’s right. I found similar looking pairs online from the early 1900’s. So I wonder if they belonged to his grandfather. Henry Thomas Fuller. My dad remembers these binos from when he was a kid so my grandad must have had them a while. Thing is, after doing the family history research, I can’t help but wonder if these opera glasses were part of the ‘theatrical items’ stolen by Henry Thomas Fuller in 1906? I hope not! …but it’d be quite fitting for a pirate to be wearing swag round their neck! Perhaps I should be careful what I go looking for! 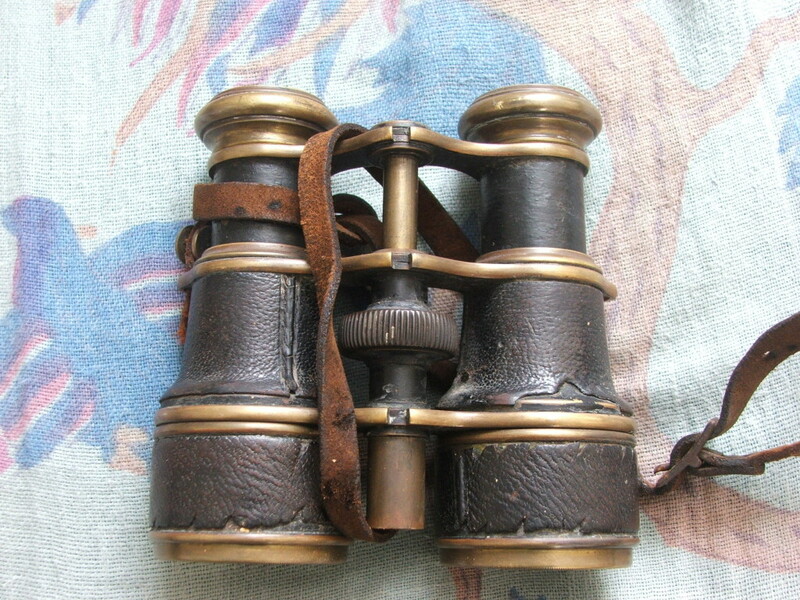 This entry was posted in Fuller and tagged early 20th century binos, Fuller on 5th October 2015 by admin. Thomas Fuller was born 3rd Sept 1795 to Robert Fuller and Jane Ann Bachell and baptised 4th Oct 1795 at St John’s, Margate. Born at: Margate, County of Kent, 4th day of Sept 1795. Height: 5ft 4 3/4 inches. First went to sea as: Apprentice. Has served in the Royal Navy: No. Has been in Foreign Service: No. When unemployed, resides at: Margate. Issued at: Ramsgate, 21st day of Dec 1844. On the 27th Nov 1819, Thomas married Mary Ann Overton at St John the Baptist Church in Margate. Stephen Cook and Richard Mummery. I think Richard Mummery must have been a Parish Clerk as his name appears a lot in the records as a marriage witness. Mary Ann Overton was born in Hoo nr Chatham, Kent c1797. Mary was baptised on the 3rd Sept 1797 at Saint Werburgh, Hoo, Kent and her parents were given as Charles Overton and Mary. Charles Francis Fuller, born 9th Sept 1822, Margate, Kent, bp 13th Oct 1822, father’s profession given as ‘Mariner’ He died 6th Jan 1857. Robert William Fuller, born c1832, Margate, bp 26th Feb 1832, father’s profession given as ‘Mariner’ he died 1847, Margate. Thomas Fuller, age 45, Mariner, born Kent. Mary Fuller, age 40, born Kent. Elizabeth Fuller, age 20, born Kent. Thomas Fuller, age 15, born Kent. Richard Fuller, age 14, born Kent. James Fuller, age 12, born Kent. Robert Fuller, age 9, born Kent. William Fuller, age 6, born Kent. Thomas died in 1848 and was buried 1st Nov 1848 in St John’s, Margate. Source Citation: Class: HO107; Piece: 1629; Folio: 200; Page: 10; GSU roll: 193530. 1. Mary Fuller, Head, Widow, age 54, Charwoman, born Rochester, Kent. 2. Elizabeth Ann Fuller, Daughter, unmarried, age 30, Shoebinder, born Margate, Kent. 3. Richard Fuller, Son, unmarried, age 24, Porter, born Margate, Kent. 4. James Fuller, Son, unmarried, age 31, ‘?’ born Margate, Kent. 5. William Fuller, Son, unmarried, age 17, Baker, born Margate, Kent. 6. George Fuller, Son, age 9, Scholar, born Margate, Kent. Source Citation: Class: RG 9; Piece: 534; Folio: 62; Page: 3; GSU roll: 542656. Thomas Fuller, Son, age 5, Scholar, born Margate. Source Citation: Class: RG10; Piece: 991; Folio: 94; Page: 23; GSU roll: 838723. Mary Fuller, Head, Widow, age 74, Former Laundress, born Kent. George Fuller, Son, married, age 28, Upholsterer, born Margate, Kent. Eliza Fuller, Daughter-in-law, married, age 27, born Romford, Essex. George Fuller, Grandson, age 7 months, born Margate, Kent. Richard Fuller, Head, married, age 44, Bath Chair Driver, born Margate, Kent. Ann Fuller, Wife, age 40, Laundress, born Margate, Kent. Thomas R Fuller, Son, age 15, Linen Drapers Porter, born Margate, Kent. Eliza Fuller, Daughter, age 14, Scholar, born Margate, Kent. William H Fuller, Son, age 10, Scholar, born Margate, Kent. George Fuller, Son, age 7, Scholar, born Margate, Kent. James Fuller, Son, age 5, Scholar, born Margate, Kent. Caroline Fuller, Daughter, age 2, born Margate, Kent. Charles H Fuller, Son, age 1 month, born Margate, Kent. Mary Ann Fuller nee Overton died in 1877 and was buried in the Parish of St John, Thanet age 82 years on the 3rd March 1877. Research guide C13: The Merchant Navy: Tracing merchant seamen. British Mercantile, Whaling and Fishing Records of the 19th & 20th Centuries by Len Barnett. This entry was posted in Fuller, Overton and tagged Fuller, Kent, Margate, Mariner, Merchant Navy, Overton on 27th June 2015 by admin. Charles Francis Fuller was born 9th Sept 1822 in Margate, Kent (according to his Merchant Seamans record). He was baptised in the Parish of St Johns, Margate 13th Oct 1822. His parents were given as Thomas and Mary Fuller of Margate and his fathers profession was listed as ‘Mariner’. June 7th 1818: Mary Jane, daughter of John and Mary Spratt, Abode: Ash, Fathers Profession: Labourer. 1. Henry Thomas Fuller, born 1843, Ash, Kent. 2. Mary Jane Fuller, born 1847, Thanet, Kent. 3. Thomas Charles Fuller, born 1850, Medway, Kent. Died 1896, buried in the Parish of St John, Thanet, October 6th 1896, age 46 years, abode: Thanet Union. 4. John C Fuller, born Margate c1850-1854 (according to census records). 5. Thomas Robert Fuller, born Margate c1852. 6. Robert J Fuller, born Margate c1852-1861 (I think 1856). 1. Chs Fns Fuller, Head, married, age 28, Mariner, born Margate, Kent. 5. Thomas Charles Fuller, Son, age 1, born Margate, Kent. The Victory Lugger, a well known boat to many Margate visitors, which was lost last Monday night, was worth from 300/. to 400/. The following is a list of the names of a portion of the crew: Issac Solly, aged 46; John Smith, aged 63; George Smith, aged 29 (father and son); William Emptage, aged 52; John Emptage, aged 29 (father and son); Charles Fuller, aged 34; Henry Paramor, aged 27; Frederick Batt, aged 22; Abraham Busbridge aged 35. Subscriptions in aid of these poor men’s widows ad orphans are urgently solicited. John Smith, aged 63 years. The shipwreck of the Northern Belle and the loss of the Victory. The Wrecking of the Northern Belle, an article by Mick Twyman published by the Margate Historical Society in December 2001. A new plaque unveiled in tribute to the men who died on the Victory. Article from the Isle of Thanet Gazette. Dedication Service of the Victory Lugger Memorial Stone at Margate. A letter regarding subscriptions to the widows and orphans affected by the sinking. A Boatmans Tales, article about the sinking of the Northern Belle. Newspaper article from The Perth Gazette and Independent Journal of Politics and News (WA : 1848 – 1864). This entry was posted in Fuller, Spratt, Surnames and tagged Ash, Fuller, Kent, Margate, Merchant Navy, Northern Belle, Spratt, Thanet, The Lugger the Victory on 12th May 2015 by admin. Henry Thomas Fuller – General dealer or just a general rogue? In 1853 when Henry was 14 he lost his father who died on the Lugger the Victory, which went to save the American ship the Northern Belle. This left Henry as the the eldest child of 7 siblings. See blog post. 1. Jane Fuller, Widow, age 40, Laundress, born Margate, Kent. 2. Henry Fuller, Son, unmarried, age 18, Labourer, born Margate, Kent. 3. Mary Fuller, Daugh, unmarried, age 14, born Margate. 4. John Fuller, Son, age 9, born Margate. 5. Thomas Fuller, Son, age 9 born Margate. 6. Robert Fuller, Son, age 9, born Margate. 7. Charles Fuller, Son, age 4, born Margate. In 1868 he married Elizabeth Ann Edwards in Thanet. I believe Elizabeth already had an illegitimate daughter called Sarah Jane Edwards born 1866 in Thanet and baptised 15.7.1866 at St John the Baptist Church, Margate. Sarah Jane can be seen staying with Elizabeth’s sister Mary Christiana Edwards (who had then married and was known as ‘Christiana Batchelor’) in 1871. Sarah Jane Edwards was listed as her niece age 4. William Henry Thomas Fuller, bp 3.3.1869 St John the Baptist Church, Margate, fathers profession: Labourer, abode: Margate; buried 9.3.1869 aged 2 1/2 months. NB The baptism was a private baptism which often meant the baptism of a person (adult or infant) who might die before being able to attend the church for a public baptism. Sarah Ann Fuller, b. 25.6.1875 bp 3.10.1875 St John the Baptist Church, Margate. Elizabeth Maria Fuller, b. 21.11.1877 Thanet, bp. 4.11.1881 St John the Baptist Church. Margate, fathers profession: Labourer, abode: Victoria Rd, Margate (Elizabeth was baptised at same time as her sister Bertha). Assaulting a Constable-At the Borough Magistrates sitting on Wednesday; a widow named Jane Fuller was charged before George E Hannam; T Blackburn and J.B Flint Esqrs with assaulting Police Constable Chas. Harlow in the executing of his duty, on the 16th inst. Fined 10s and 8s 6d costs, or 14 days hard labour. The son, Henry Fuller, had been brought up on the previous Monday on charges of being drunk and assaulting police constables Millgate and Harlow in the execution of their duty, and sentenced to 7 days for the first and 21 days for the 2nd offence. So I guess his mother set an example then! April 7th 1880: Henry in trouble again! Henry Fuller, age 38 Labourer, once before convicted of Felony and 5 times summarily convicted. Offence: Obtaining by false pretences 17s. 6d. the money of John Francis Brown at St John the Baptist on March 1st 1880. Verdict: Guilty of obtaining money by false pretenses. Sentence of the court: 3 calendar months hard labour HM Prison Canterbury. Degree of Instruction: N (cannot read or write). Date of warrant: 1880 March 2nd; Received into custody March 3rd 1880. Source: A Calendar Of Prisoners Tried At The General Quarter Sessions Of The Peace Series: HO140; Piece number: 50; Record set: Crime, Prisons & Punishment; Category: Institutions & organisations; Record collection: Prison registers; Collections from Great Britain. 22nd Oct 1888: Henry can’t keep out of mischief…. Henry Fuller age 46, Labourer. Sentence: 6 Calender months: HM Prison Canterbury. Tried 22nd Oct 1888 found guilty of Larceny after a previous conviction. 28 days; 19th April 1870 (drunk and assaulting police) Margate. 3 calender months 31st December 1872 (stealing 10s.) Margate. 21 days 4th Oct 1876 (assault) Margate. 1 month 30th Oct 1879 (want of Sureties) Margate. 3 calender Months 7th Apri; 1880 (obtaining 7s. 6d. by false pretences) Margate sessions. 5 years Penal servitude 4th April 1883 (House breaking) Margate Sessions. Source: A Calendar Of Prisoners Tried At The General Quarter Sessions Of The Peace, Series: HO140, Piece number: 104, Record set: Crime, Prisons & Punishment, Category: Institutions & organisations, Record collection: Prison registers, Collections from Great Britain. Tried before A.J.Tassell, and others. Committing Magistrate: H.B. Hammond, Esq, Ramsgate. Henry Fuller, age 66, labourer. Offence as charged in the Indictment: Feloniously stealing one sheet and four waistbands, together value 4s., the goods of the Guardians of the Poor of the Isle of Thanet Union, on the 5th December 1903, at Minster, Thanet. Sentence or Order of the Court: Three months hard labour. When tried: Jan 5th 1904. Degree of Instruction: Imp (can read and write imperfectly) . Date of Warrant: 8th Dec 1903. When received into custody: 8th Dec 1903. Borough of Margate Petty Sessions, 31st March, 1896, two months hard labour. 3 months hard labour, Margate Petty Sessions, 28th December, 1872 (stealing money). 3 Month hard labour, Margate Quarter Sessions, 7th April, 1880, (obtaining money by false pretences). 5 years penal servitude, Margate Quarter Sessions, 4th April, 1883 (house breaking). 6 calendar months hard labour, Margate Petty Sessions, 22nd Oct, 1888 (stealing a watch and chain). 1 Month hard labour, Margate Petty Sessions, 9th December, 1800 (stealing a coat). 1 Day, Margate Petty Sessions, 11th March 1906 (Stealing theatrical articles). 2 Months hard labour, Margate Petty Sessions, 31st March 1896 (stealing a meat safe). And 15 summary convictions for drunk and disorderly, assault, using obscene language and threats. Source: Henry Fuller Age 66, Labourer, Birth year: 1838, Year: 1904 5th Jan, Place: Kent Court St Augustine’s. A Calendar Of Prisoners Tried At The General Quarter Sessions Of The Peace Series: HO140 Piece number: 232, Record set: Crime, Prisons & Punishment Category: Institutions & organisations Record collection: Prison registers Collections from Great Britain. This entry was posted in Edwards, Fuller, Spratt, Surnames and tagged Ash, Edwards, Fuller, Kent, Margate, Spratt on 10th May 2015 by admin.